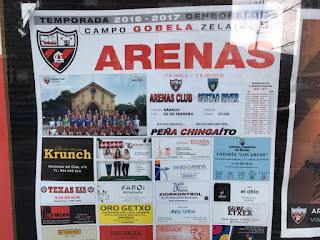 Arenas Club de Getxo is a professional football club from the town of Getxo, on the north bank of the River Nervión near to Bilbao in the Basque Country who were formed in 1909. 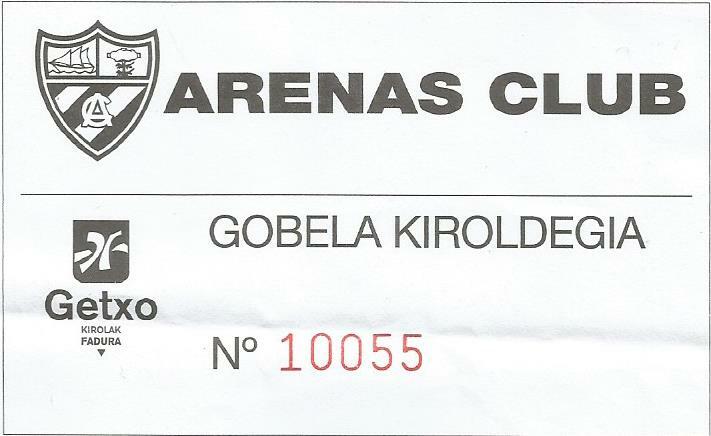 Originally known as Arenas Football Club, it changed to its current name in 1912. 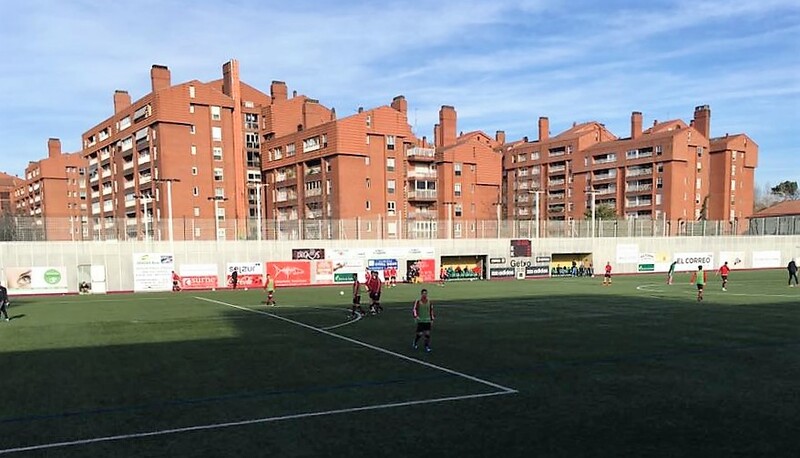 A year later the club moved into Campo de Jolaseta in the adjacent district of Neguri, playing friendly games, including a series against FC Barcelona, Arenas joined the Campeonato Norte. Arenas won the championship in 1916-17 and qualified for the Copa Del Rey; reaching the final before being defeated by Madrid FC at the Camp de la Indústria in Barcelona. Arenas won Campeonato de Vizcaya in 1919 and once again reached the final of the Copa Del Rey where they lifted the trophy after a 5-2 extra time victory over FC Barcelona. 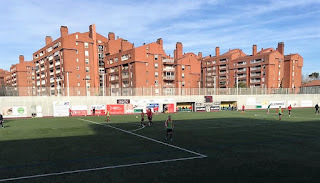 The match was played at Martínez Campos in Madrid as Félix Sesúmaga netted a hat trick with the other goals coming from José María Peña and Ibaibarriaga. Two years later Spain played their first ever international; fielding Sesúmaga and Francisco Pagazaurtundúa of Arenas in the team. The club went on to reach two more Copa Del Rey finals. In 1925 they were defeated 2-0 by FC Barcelona moving to their new home; Campo de Gobela. In 1927 they went down by an only goal to Real Unión in Zaragoza. Arenas became founder members of La Liga in 1928-29, finishing in third place the following season. In 1934-35 the club finished bottom of the table and were relegated to Group II of the Segunda División. Arenas remained at that level until 1943-44 when they were demoted a further step to Group III of the Tercera División. The club won the division in 1945-46 and 1946-47 but failed to be promoted through the play offs. A further Group III Tercera División title arrived in Getxo in the 1959–60 season. 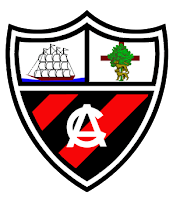 Arenas continued in the third tier until the completion of the 1969-70 season when the club were relegated to the regional fourth tier División de Honor de Vizcaya. Arenas employed a young Javier Clemente as manager in the 1975-76 season, taking the team to promotion back to the Tercera División. Following a re-organisation of the Spanish league system in 1977-78, the Tercera División became the fourth tier. A second place in Group II in the 1978-79 campaign saw Arenas win promotion to the third level Segunda División B. However, the team went straight back down after just one season. 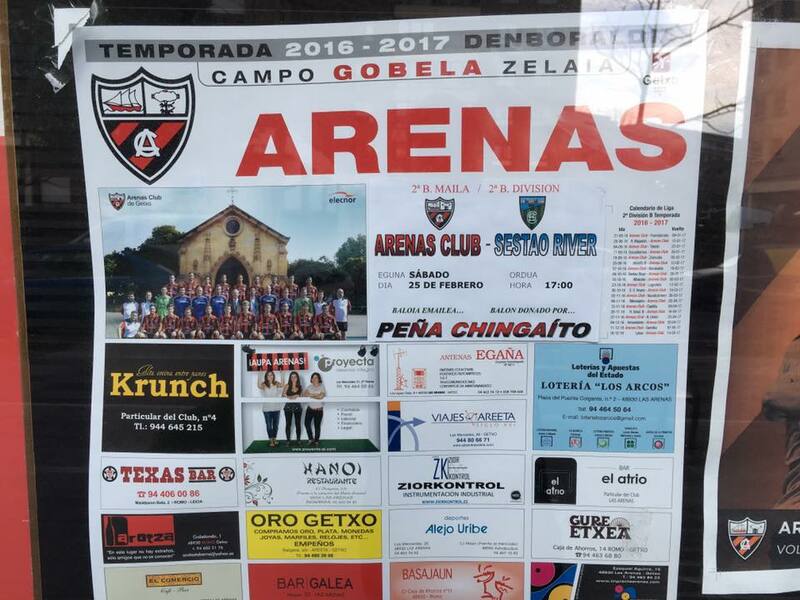 Arenas returned to the fourth tier Tercera División until the end of the 1981-82 season. A final place finish demoted the team to the fifth level División de Honor de Vizcaya before returning just one season later after lifting the league title. 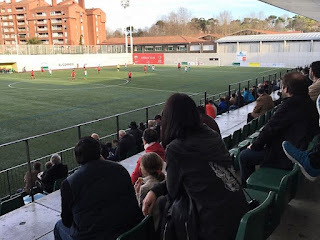 Fourth level football was played at Campo de Gobela until 1994-95 when a bad season saw a further demotion to regional División de Honor de Vizcaya. 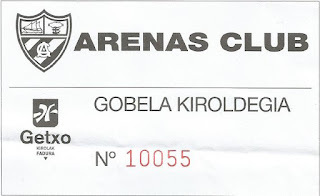 Two seasons later Arena fought back to the fourth tier. 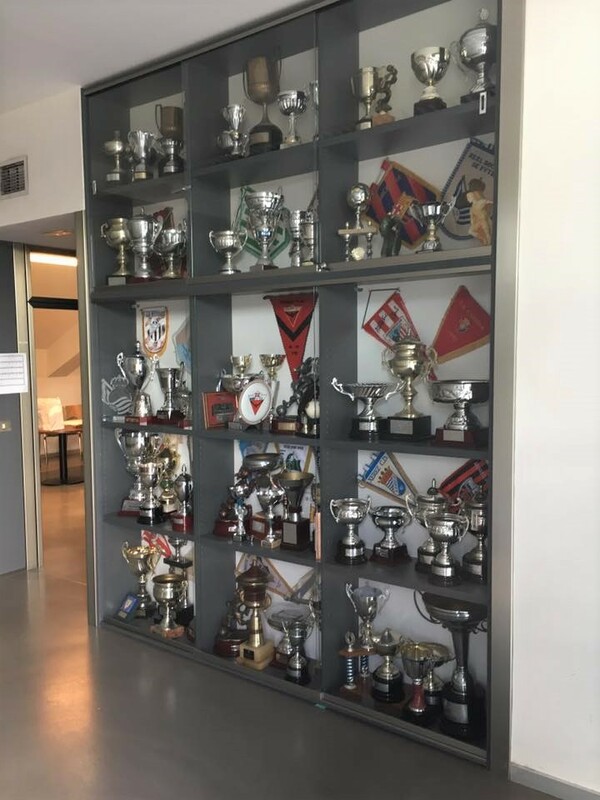 Apart from a third place finish in 1999-00 the team generally finished in mid table until 2012-13 when Arenas weighed in with a runners-up spot. Changes came off the field as the new Campo Municipal de Gobela was opened in 2004 on the site of the old stadium. 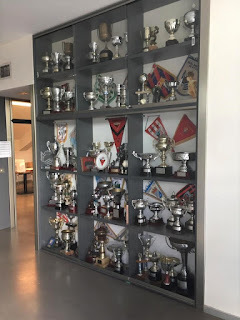 After a couple of third place finishes the club were promoted at the end of the 2014-15 season under manager Bolo, to the third tier Segunda División B, where they resumed in Group II. An eighth place finish saw the club qualify for the Copa Del Rey. This was followed by a mid table finish in the 2016-17 season. Arenas Club de Getxo will play in Segunda División B Group II in the 2017-18 season. My weekend trip to Bilbao and the Biscay region was into my second day and I loved everything about it. As ever my schedule was packed. I’d already parts of under age games at Danok Bat and Ibarreko. After returning to my fine hotel for a quick siesta I headed on the Metro to Neguri from where I walked down to the bay front on a stunning afternoon. The beach and marina looked fantastic as I continued around Zugatzarte Etorbidea before heading inland along Cervantes Kalea and then Negubide Kalea past Gobela station. Campo Municipal de Gobela was just a couple of hundred yards further up, though like several stadiums I’d visited around the region, you’d have been hard pushed to spot it without previous knowledge as it formed part of a community facility. My ticket cost €15 from a booth. No programmes were issued. The entrance took me up a few steps to the only spectator facility. 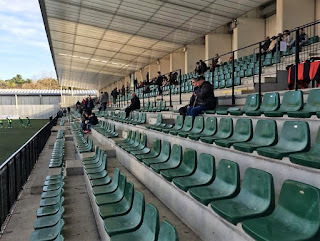 The long raised stand had steep steps, which most sat on. A few bucket seats in the centre provided facilities for dignitaries. A club shop was set up by the entrance. Large walls were behind either goal; proudly displaying banners commemorating Arenas Copa Del Rey victory. The far side was backed by tennis courts with the team benches in front. The pitch was artificial. Noticing a door right at the end of the stand with people coming and going, I decided to have a look; finding a nice enough bar with cheap beer and pintxos. I was surprised to find a police presence outside but no segregation once inside the stand. Many of the fans were in fancy dress for the carnival weekend. 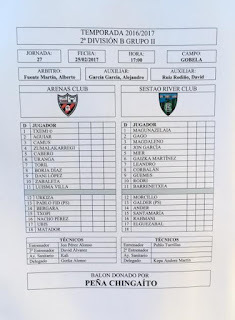 The local derby between two sides on opposite banks of the Nervión kicked off at 5pm, which was welcome on a warm afternoon. It offered high quality in terms of technique. Arenas had a majority of possession in the opening stages. Alberto Toríl, on loan from RCD Mallorca had a chance when through, but he couldn’t beat Gorka Magulazenaia in the Sestao net. Defender Eneko Zabaleta also had a couple of efforts for the home side, before the visitors grew into the game. The half finished blank as I headed back to the bar where I got chatting with a group of fellas from my same flight who visited a different city in Spain that same weekend for football, culture, food and drink. It was good to meet some Orient fans among them, including Mark who I exchanged Twitter details with. 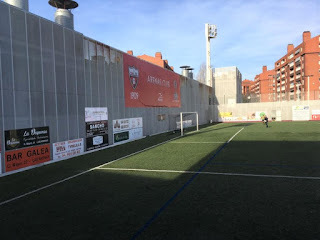 Orient Braces kept me up to date with some excellent information and we agreed to meet up before the Athletic Bilbao game the following day. Dani Lopez had a goal disallowed for Arenas soon after the restart. Chances continued to be at a premium with Arenas continuing to have the better of the exchanges. 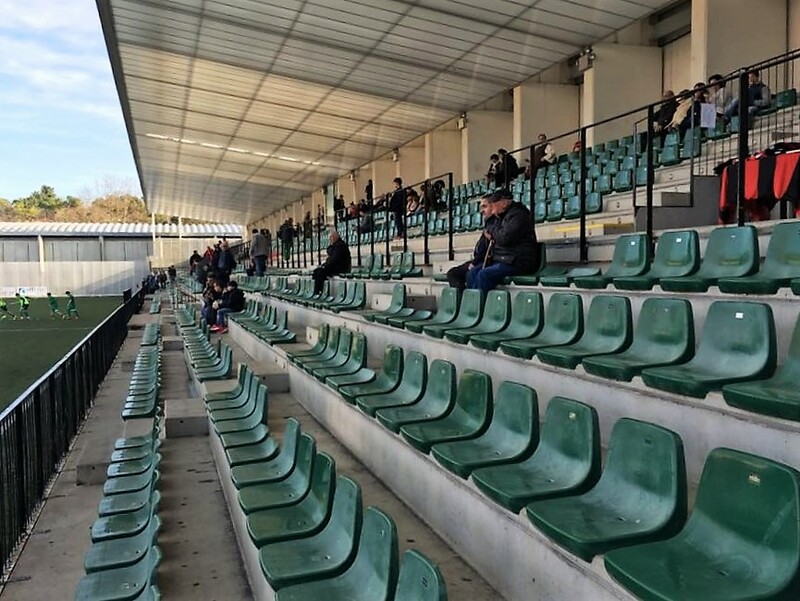 However Sestao began to press as the game entered the final quarter. Txemi Talledo made a fantastic save for Arenas from a Armando Corbalán effort. Luisma Villa had a final attempt to break the deadlock in favour of the home side with a free kick. At this point it was time for me to head away with about seven minutes remaining. 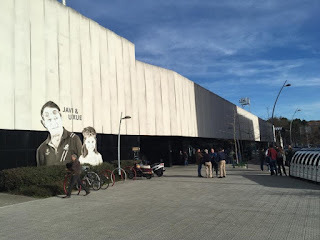 I had an evening fixture to attend so it was time to take the Metro to San Mamés, only to find that the bus station had changed location by a hundred yards overnight. I soon put myself right and got ready to head to Eibar!